The yellow bedroom in the yellow house. For those of you who don't know me, I am drawn to all natural colors and fabrics and only use a splash of deep garnet when I use any color at all. My move East to a beach cottage presents an opportunity to try something new but my challenge is to be creative in how I blend my style with what is already there. 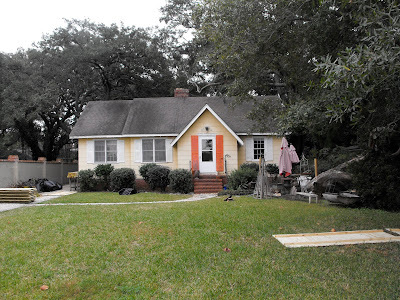 Since I am not going to paint the outside of the cottage I have decided I want to paint the orange shutters by the door. Suggestions? Have not decided on color yet. I changed the yellow paint in what will be my bedroom immediately. I was going to stay neutral - oatmeal or parchment - but decided to take a look at the OOPS paint at Home Depot. OOPS paint is the mistake paint that gets sold for $5.00 a gallon or $1.00 a pint. Can you believe I found two gallons of Espresso colored OOPS paint! The french doors which open onto a back deck, white ceiling and built-ins, and skylight in the bedroom offer the light needed to counterbalance dark walls. Stand-by for le fotografie. 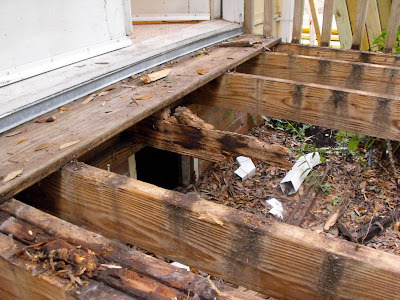 My back deck is rotted to the joists. Watch your step. 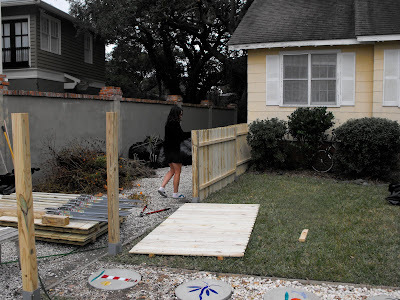 I had to fence the front-yard as the backyard only consists of that lovely deck. And so it begins...Thursday it was 80 degrees and those darling bugs were out in full force. Pray for my protection from these demon creatures. Friday it was 40 degrees and I was ripping open boxes looking for my wool socks and the jacket I bought for all-night duty calls processing crime scenes. So much rain today and tomorrow the fencing is on hold. Just another chance practicare patienza (to practice patience). maybe paint the shutters a very pale green? 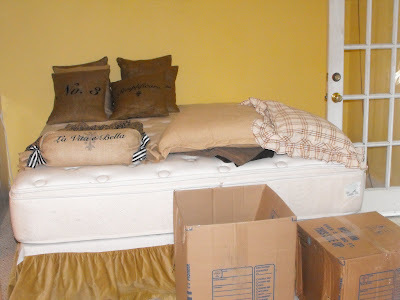 Can't wait to see how the bedroom turns out! Pale green sounds nice...or deep burgandy? Black would be a good contrast if you are painting all the shutters. Progress! It seems you have inherited the "Honey-Do" list from hell. Good on you for keeping after it. Kim - I'm with Angie and Nancy, pale, pale green or espresso and all the shutters should be painted or paint the ones around the door white to match the others and paint the front door a dark, dark brown. That's my two cents' worth. . .
btw, I miss you, so does Frankie! Wow, I love a front yard fence, it gives you so much privacy and reminds me of European homes. Espresso paint is perfect for you! Yes bugs and wood rot, welcome to the South! Sorry! Oh don't forget the summer "palmetto" bug aka COCKROACHES...oh how they do love to suger up things 'round here!